Getting rid of bees and wasps that enter a furnace intake or exhaust vent can be costly. 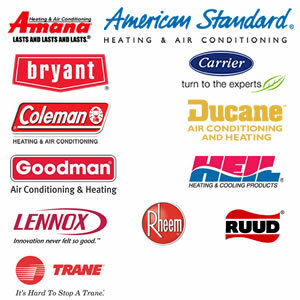 Even the simplest of service calls often cost home owners a minimum of $200, along with the inconvenience of having a high efficiency appliance that does not operate and meeting with a licensed HVAC technician at home. More complex and costly problems, such as a large active nest within the furnace cabinet, may require the assistance of both a licensed exterminator and HVAC technician. 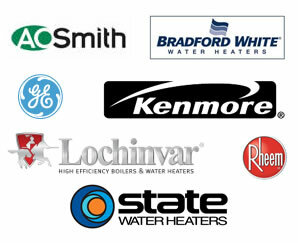 Fortunately furnace problems resulting from bees, wasps, and other insects can be avoided by utilizing proper prevention techniques that are inexpensive. Unfortunately, many people don’t know how to protect furnace vents correctly until they have a problem as is illustrated in the video below. In the video above, you will see a portion of a 2″ furnace exhaust vent being scoped on a service call from the exterior vent termination. The reason why the vent was scoped is because the furnace entered a mode known as a lockout and did not operate. Resetting the furnace resulted in three failed attempts at ignition and a hard lockout that lasted for an hour. The error code returned was for a pressure limit switch fault, meaning there was a good chance something entered either the furnace’s intake or exhaust vent. Both the intake and exhaust vents were fully scoped, but we wanted to show you the portion of the exhaust vent where an abandoned yellow jacket nest was discovered. Though the nest is small, it is located at a critical bend within the system and was the source of the lockout problem. After a nearly $300 service call, and the nest removed, the furnace operated normally and is now protected with our 2″ insect screen. Unfortunately many people have a false sense of security because their vents have rodent screens in them. Rodent screens are not designed to keep bees, wasps and other insects out of furnaces and their ventilation systems. In fact, rodent screens actually help to shield nests from other wildlife as they are protected behind a rodent screen as pictured to the left (click on the picture to enlarge it). 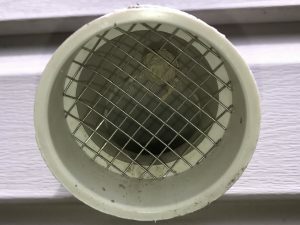 As we note on our best practices page, rodent vent screens are typically only beneficial during winter and when temperatures are below freezing. During spring, summer and fall, the use of insect vent screens is required to provide additional protection from bees, wasps and other insects. 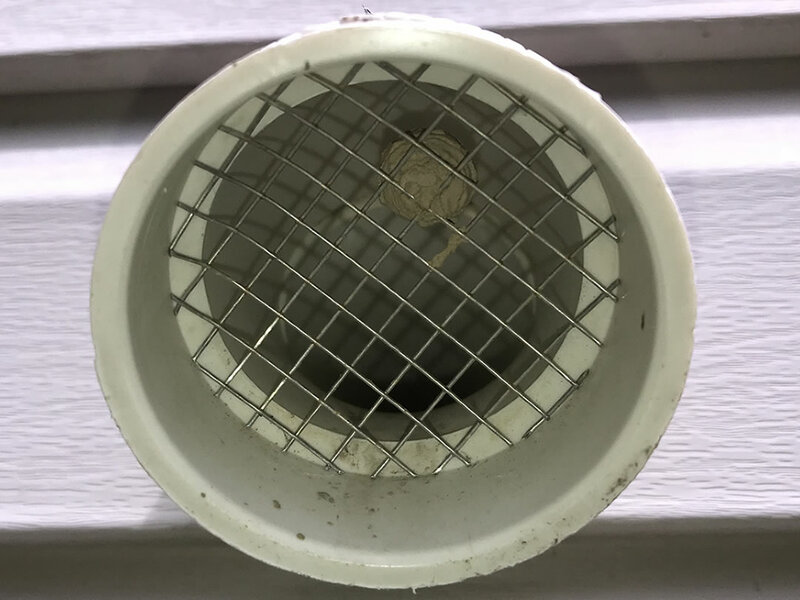 As noted previously, the easiest way to avoid bees and wasps from building hives within your furnace or ventilation system is to use the appropriate vent screen(s) for the season. Most residential dwellings with PVC intake exhaust vents utilize either 2″ or 3″ PVC termination hubs. 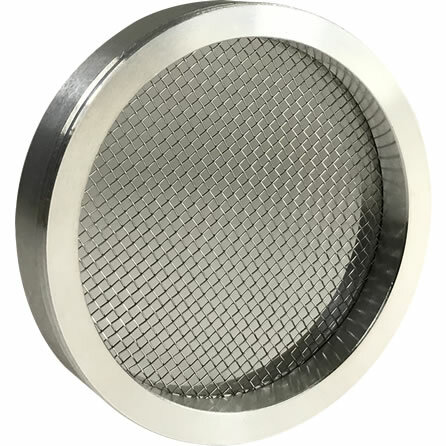 Our PVS-IS2 insect vent screen is designed to fit inside a 2″ vent termination hub with an inside diameter of 2-3/8″. Our PVS-IS3 insect vent screen is designed to fit inside vent termination hubs with an inside diameter of 3-1/2″. Both the PVS-IS2 and PVS-IS3 are designed for use on PVC intake and exhaust vents when insects are active. High efficiency furnaces require added airflow during winter, which is why we sell all-season vent screen kits in our store. It is important to note that if you suspect there is an active bee or wasp nest within your furnace and/or ventilation system, you should contact a licensed HVAC technician immediately. Signs of an active nest may include hearing buzzing/strange noises by the furnace or within the vent pipes, seeing bees or wasps inside the furnace cabinet or even elsewhere within the home. On larger nests inside furnace cabinets, it is not uncommon to witness bees and wasps entering and existing the intake vent termination. To avoid injury to you or the occupants of your home, by releasing bees or wasps into the main living area, do not open the furnace cabinet. A licensed HVAC technician is best prepared to identify the location of the nest and remedy the problem, even if it requires the assistance of a licensed pest control specialist.